Just last week, I was brimming with confidence and couldn’t wait to take on the Globe R4H half-mary. After all, my recent training runs indicated that a new 21.1k PR was just around the corner. I had four good workouts last week, beginning with my 21.1km long run on March 6 and culminating in an easy 5.4km with 6×200 hills on March 10. I did my Sunday long run at the track (I know, 52 and 3/4 laps in all!) in 1:54:37, which, technically, is my new HM PR. It’s not so much that I set a PR in that run that got me excited; it’s the fact that I wasn’t meaning to that tickled me pink. In fact, I ran it at E-pace, save for the last 5k, which I tried to run at my target HM race pace. I was able to run only 8 laps of that final 5k at 2:00 ave. per lap (5:00 mpk). However, my 9th and 10th laps were 2:04 and 2:07 respectively, so I decided to just treat the remaining kilometer and change as my cool down. My average heartrate for the entire run was only 156, which was well-within my aerobic zone. Then, some cause for concern. 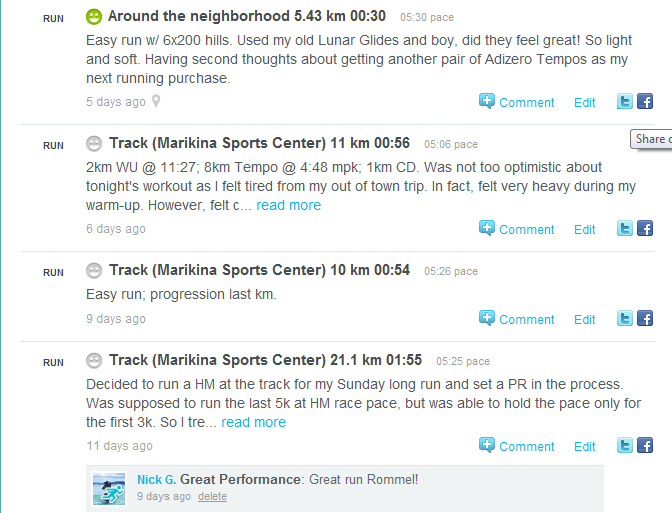 Last March 13, I decided to do my Sunday long run at BHS. I was supposed to run 22km, but I was able to finish only 14.9km. My legs felt very heavy, which I attributed to muscle fatigue. I thought that i had yet to recover from my Thursday tempo run and my Friday hills training. There was also the matter of the slight discomfort that I felt in my right knee. I was kicking myself for doing two quality workouts on consecutive days. Not too smart. I was still walking with a limp on Monday, but on Tuesday morning, I was happy to see that the pain had subsided. It had to take a lot of EQ on my part to fight the urge to run that day. However, I am determined to take my kuya slash coach slash running guru’s advice to heart and just consolidate my gains and not try anything stupid in the following days. This morning, after 2 days’ complete rest, I ran an easy 5.4k. I felt some discomfort in my right knee a few hundred meters into my run. Fortunately, it went away shortly thereafter. While I was supposed to do an easy 10k, I decided to do a time-based easy run of 30 mins. so as not to punish my knees too much. I felt fine after the run, but now, my ITB feels stiff. There’s just so much I could do to treat my ITBS without sacrificing my fitness. I’ve been dealt a bad card and now, the chips are definitely stacked against me. I have no choice but to go “all in” on this one. Que sera, sera.